Urban political ecology combines the approaches of political economy and the study of human ecology. One subfield of this subject focuses on critically examining state policies relating to urban environmental and economic governance through a lens of distributional justice. 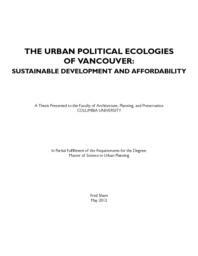 This thesis investigates how political, economic, and social processes have collectively (re)created inequitable urban natures in Vancouver, Canada, under the banner of sustainability. In 2008, Vancouver's City Council unanimously voted to pass the EcoDensity Initiative, a comprehensive policy and vision document that strategically used increased densities and high performance green design to not only reduce the city's ecological footprint, but also simultaneously enhance housing affordability and livability. Using case studies, interviews and comparing assessed property value changes, this thesis demonstrates that Vancouver's urban environmental governance policies have contributed to dramatically increasing property values, effectively exacerbating the city's housing affordability crisis for low-to-middle income earners. At its core, EcoDensity strategically mandates high performance green design not only to meet ecological goals, but also to buttress markets of green enterprise and enforce its consumption as a means of economic development. While the pursuit of ecological sustainability and economic development are worthy priorities, without a realignment of institutional capacities to address social equity, the city's ecological and economic gains may be eroded.